BASELAYER has a specific mission that guides everything we do—to reshape how data center infrastructure is viewed leveraging advanced modular technology and cloud-based management software. BASELAYER offers customers modular data center hardware built in the United States at our facility in Chandler, Arizona. The growth of the Industrial Internet of Things as well as AR and VR technology are driving the need for Edge data centers. Worldwide revenues for the augmented reality and virtual reality (AR/VR) market are forecasted to grow to more than $162 billion in 2020 from $5.2 billion in 2016, and challenges with 4k VR looking blurry or low resolution due to scaling in a 360-degree viewing area are causing VR platforms, including YouTube, to move toward 8k VR content. This results in a network impact that is four times greater than that of 4k VR videos. Latency requirement for Augmented Reality (AR) is sub 10ms and sub 5-7ms for Virtual Reality (VR) gaming. 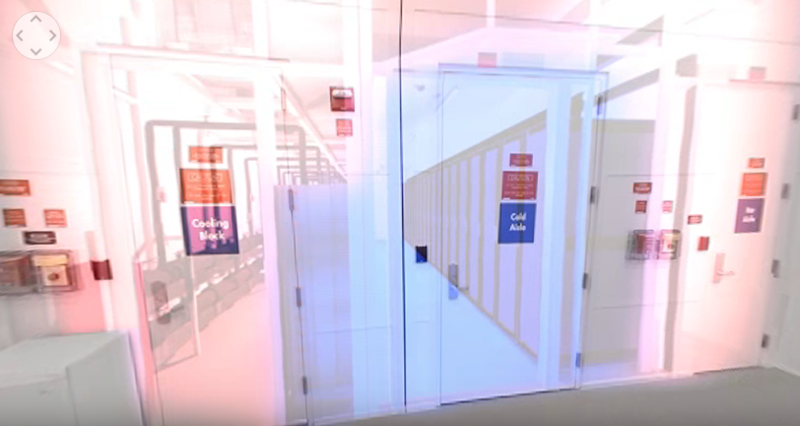 Edge data centers will be needed closer to end users to prevent latency and slow performance.In this VR360 video tour, we give you an inside look at one of our newest products that is meeting this need, the EDGE XC10 modular data center. Let’s take a peek at some of its features! Simplify the Data Center. Make It Smart. All EDGE products from BASELAYER are made up of cooling block paired with up to five IT blocks. This gives users the ability to balance cooling and power with required rack counts and densities. NEMA 4 rated and capable of UL 2755 field compliance to support demand anywhere, the XC10 is designed for outdoor use but does have indoor applications. The XC10 works to deliver an enterprise-level data center with a pressurized plenum created between the cooling and IT blocks. Filtered air moves through the openings at one end of the IT block and flows through the IT equipment. It’s returned through a pressurized top air return. Once in the cooling block, the returned air moves through several heat exchange coils where heat transfer takes place and the cycle starts again. Accessibility and proper illumination are key features of the XC10. We’ve also taken special care to ensure that maintenance is a snap. On one side of the unit there are two pipes—the return and supply water loops. This unit operates in a closed chill water loop. The return temperature is set to 55 degrees Fahrenheit while the supply temperature is set to 45 degrees. All key set points are adjustable by the operator. On the other side, there’s a series of eight fans on top paired with eight coils on the bottom. Each pair can support up to 125 kilowatts of cooling and offer dynamic zone controls. The result? Nineteen percent efficiency over traditional raised for deployment from a performance perspective. In total, this enterprise-level design can cool 500 kilowatts, all the way up to a megawatt of IT capacity in a single cooling block. BASELAYER’s approach to modular design leverages global partners including Siemens, BASELAYER’s global footprint of installation partners, helps to shorten startup and commissioning times in major metro areas or in remote locations. At BASELAYER, we strive to enable telemetry to flow inside and outside of the module, allowing operators to make better decisions about their IT infrastructure. Learn more by experiencing the EDGE XC10 tour today!